Surplus heat from a pectin production factory is being repurposed for heating the homes of citizens in Køge and Solrød Municipality. The company CP Kelco is repurposing waste heat from its production process by using a heat pump, while reducing noise pollution in the area. The world’s largest pectin factory, located in Køge, is also Denmark’s largest natural gas consumer. Previously, the surplus heat from this industrial production was a major untapped resource. 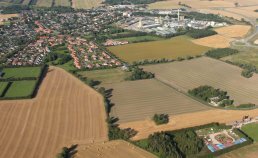 The plant’s heat is supplied to the district heating network in both Køge and Solrød Municipality, generating enough heat to cover Køge’s heating demand during the summer period. By replacing the conventional district heating with surplus heat, CO2 emissions are reduced. The project benefits not only the local environment and the climate but also the company’s bottom line, as the heat is sold to the utility company VEKS. It has been agreed that the price of the heat at any given time will be kept below the price of heat produced by other means. With this agreement in place, the project can ultimately provide consumers with environmentally friendly heat at a lower cost than conventional heat. The factory utilizes surplus heat from its production processes, from which the surrounding houses can later benefit. Reusing surplus heat is an example of circular economy practices in the energy industry; it also shows a correlation between industrial production and reduced energy demand. The project represents an investment in district heating infrastructure. It will benefit sustainable development and lay the foundation for a well-developed, coherent district heating system. Pectin is produced from an array of ingredients including citrus peel. The residual product is subsequently gasified and made into biogas. The remaining pulp is then used as fertilizer on the fields. Køge municipality is a municipality on the east coast of the island of Zealand approx. 40 km southwest of Copenhagen.